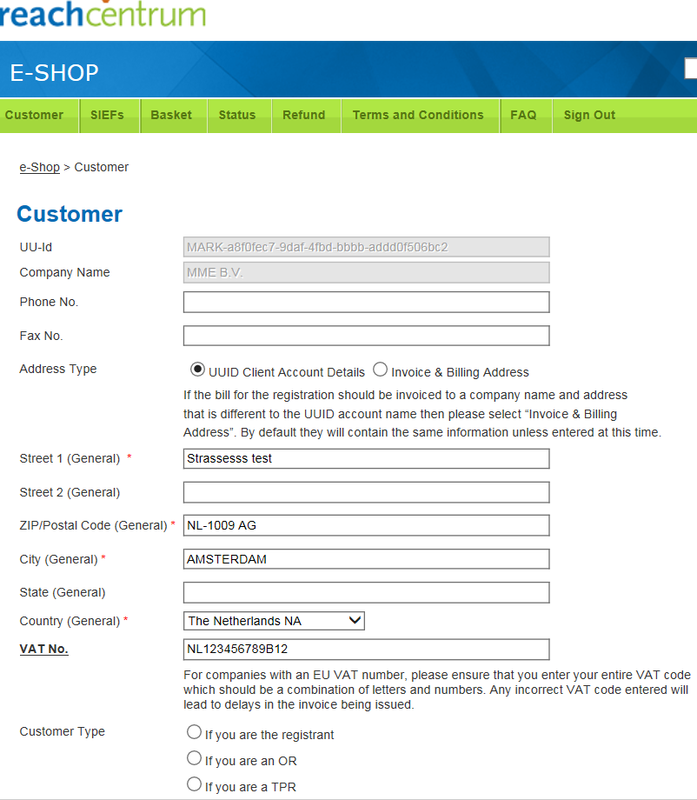 If the message "UU-ID invalid" appears when I try to create an account, what should I do? Your UU-ID must be registered in our system. If you are in a SIEF that is not yet activated in our system, you will not be able to enter the system. Please write an email to LoA@reachcentrum.eu with the UU-ID no., the name of the legal entity and the main email contact address. If the message "account not activated" appears when I try to log in after having created an account, what should I do? When you create a new user account on the LoA e-Shop you receive an email with a link to activate your account. If you have not received the email or if the link does not work, please contact us at the following address LoA@reachcentrum.eu and provide us with your UUID no. and the username. Do I need to complete every field under the customer tab? 1) UUID Client Account Details ("the registrant") - this information should correspond to the information available on REACH-IT. The legal entity listed should always be based within the EU, and should reflect either the registrant, the OR or the TPR. The VAT number (If the company is in the EU, please list your local VAT number usually starting with two letters, if outside the EU please leave blank). This information is important for the invoice. If you have provided the wrong information, the changes on the invoice will incur a cost of 50% of our current handling fee (please refer to the Terms & Conditions on the LoA e-Shop). 3) Customer Type � At the bottom of the customer registration screen you will be asked to select your customer type. This information is linked to the UUID registrant account name, not the billing/invoicing address (if different per point 2 above). Therefore, please select from one of the three given options below depending on whether the UUID account name registration reflects a registrant, an OR or a TPR. You can only select one option. Please fill the information accordingly. For more information concerning "Only representative (OR)" and "Third-Party Representative (TPR)", see below. My company is the Only Representative for three separate legal entities. Do we have to set up three accounts if we want to buy a LOA? 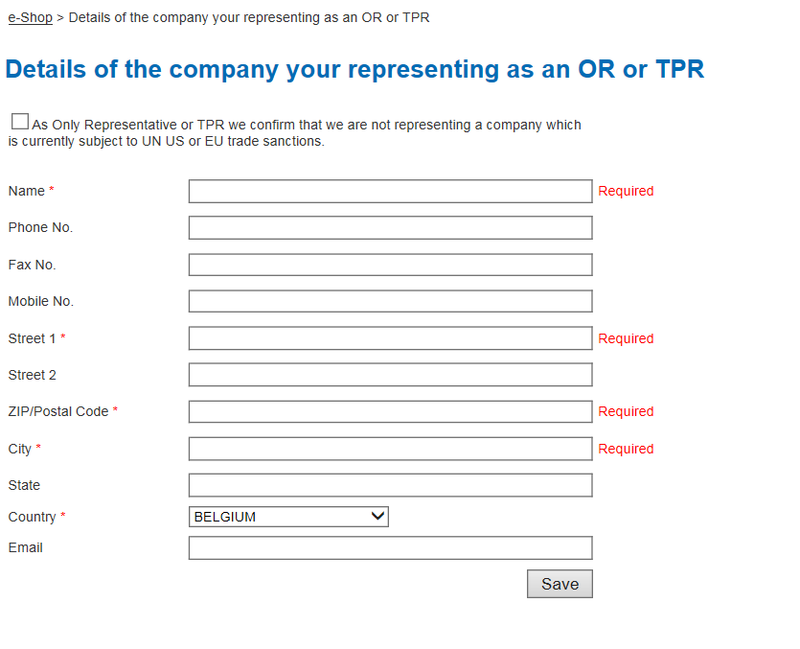 If you represent three different non-EU companies, you should create three accounts in our system. You have to indicate the name and address of the company you represent by clicking on the "customer type" under the customer screen (tab) and then fill out the information accordingly. Two of our clients need to register the same substance. Do we require one or two LoA for this substance? You need to buy a LoA for each non-EU customer unless they are affiliated. In that case, you only need to buy one LoA, depending on the SIEF Agreement conditions. My company is the Only Representative of a non-European company owned 100% by another one. Does it need to register as an affiliate knowing that the dossier will be transferred to the non-European company although the 100% owner is the one which has pre-registered the substance? You can only put your company as affiliate if you have registered the substance. We suggest that if you have pre-register as an OR for the affiliate, you could put the affiliate name on the OR screen and it will be printed on the LoA. My company is the Only Representative of a company previously represented by another Only Representative. Which information do I have to provide in order to update the LoA e-shop? You first need to send us a document signed by your client indicating the change of OR. You then have to provide us with your UUID and the substances you intend to register. I do not see the substance for which I would like to buy a Letter of Access in my SIEF list, what should I do? If this is a SIEF that is not yet activated in our system, you will not be able to see it or select it. I have done a (late) pre-registration for a substance but I do not see it in my SIEF list on the LoA e-Shop? In this case, please write an email to LoA@reachcentrum.eu with the UU-ID no., the name of the legal entity and the main email contact address. In the list I do not see the required tonnage band for the LoA I would like to purchase. The tonnage bands available on the website are the only LoA available for sale. If you need another type of LoA, please contact the consortium or the lead registrant. There is a note next to the LoA price saying: "To be determined". What does that mean? This means that the Consortium would like to first collect the number of SIEF members that are interested in to register a substance and share the costs. You can select the Letter of Access of your choice and indicate you would like to buy the Letter of Access. As soon as the price is determined by the Lead Registrant you will be invited back in the system to purchase it. If I choose a LoA and I cannot continue with the purchase, what does that mean? This means that your company has already purchased this Letter of Access. You can see an overview of your previous purchase in the status screen. A company can only buy one LoA per substance. I want to upgrade the tonnage band for a Letter of Access I have previously bought, what should I do? Depending on the amount you have paid for the Letter of Access in the past (excluding the handling fees), you might be able to upgrade your LoA by clicking on the higher tonnage band. If you cannot continue with the purchase process, please write an email to LoA@reachcentrum.eu and provide us with the information concerning your previous purchase (customer number, invoice number, UUID and name of the company). I cannot download the SIEF Agreement. How do I download it? 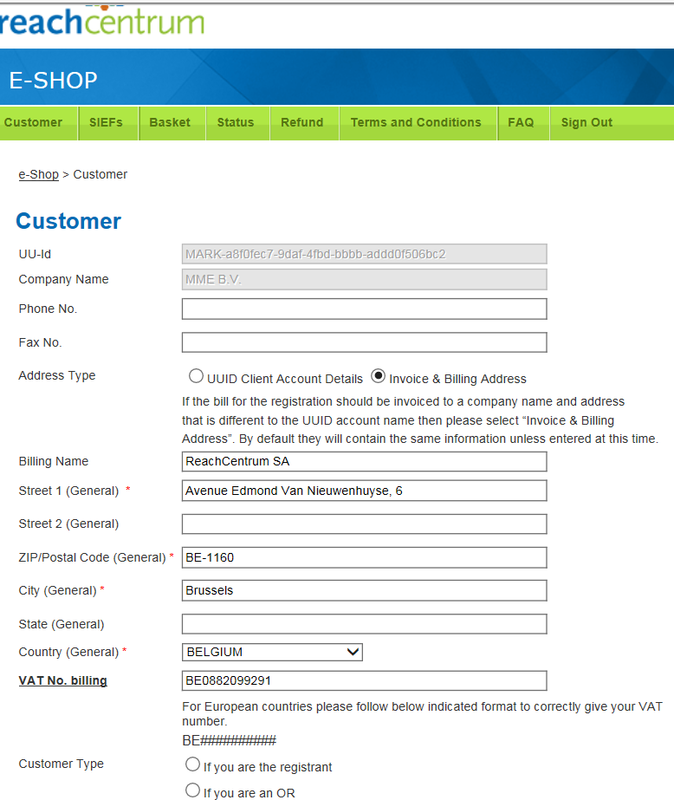 You can click on "here" to download the SIEF Agreement without committing to a purchase. I have read the SIEF agreement, but I do not want to sign it (now). What can I do? You can click on the cancel or no button and navigate with your browser buttons to the previous page. I have decided to purchase the LoA, how do I sign the SIEF Agreement? By ticking the box, you acknowledge that you agree to the Terms & Conditions of the SIEF Agreement. This constitutes an electronic signature. I do not know the UU-ID's of my company's affiliates. In this case you have to click the cancel button, look up the UU-ID's and come back in the system to enter them. If a separate invoice and Letter of Access needs to be created then the purchase price and Handling Fee will need to be charged again. I want to add an affiliate to an existing LoA. Please refer to our Terms & Conditions for the costs. Check the SIEF Agreement to see if the affiliates are covered for a particular substance. Check the definition of affiliate and see if your company meets the definition. ReachCentrum will provide you with a template document regarding the declaration of affiliation proving the corporate link between the user and affiliate(s). Please request this template from the LoA e-shop Team at LoA@reachcentrum.eu. Please fill in the template document and then submit it to ReachCentrum for its processing. The invoice is prepared upon confirmation. Once the invoice is paid, the new LoA will be provided. Why am I not able to enter my company's affiliates? Based on the provision of the SIEF Agreement, this option might not be possible for every LoA purchase. This means that each legal entity needs to pay separately for the LoA. If affiliates are covered under the SIEF Agreement, the affiliates need to pre-register the substance as well and provide the UUID to LoA@reachcentrum.eu to add it to the SIEF list of the substance.